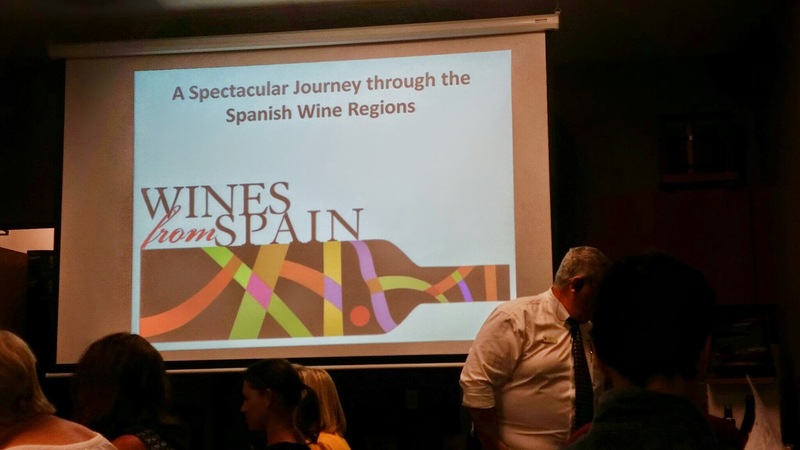 Last week I was invited to attend a wine tasting class all about the wine region of Portugal & Spain at the Total Wine and More in Laguna Hills. I am a huge wino and I love to try new regions! 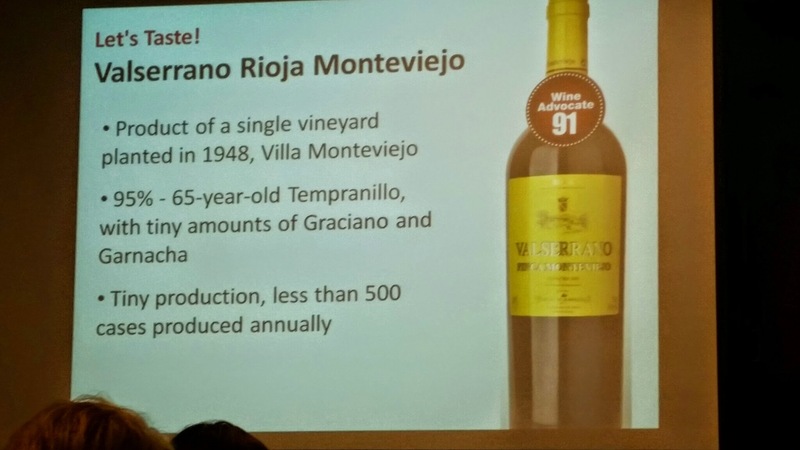 I was especially excited about this class in particular because when I was in Barcelona in June 2010, I fell in love with the wines in that area and was so very excited to try more! I cannot say I had ever tried any wines from Portugal prior to this class, other than the ever so famous port, but considering I have a friend that went tasting Portugal wines one day in Laguna Beach and booked a trip to Portugal the next day, I definitely thought these wines would have something beneficial to offer! 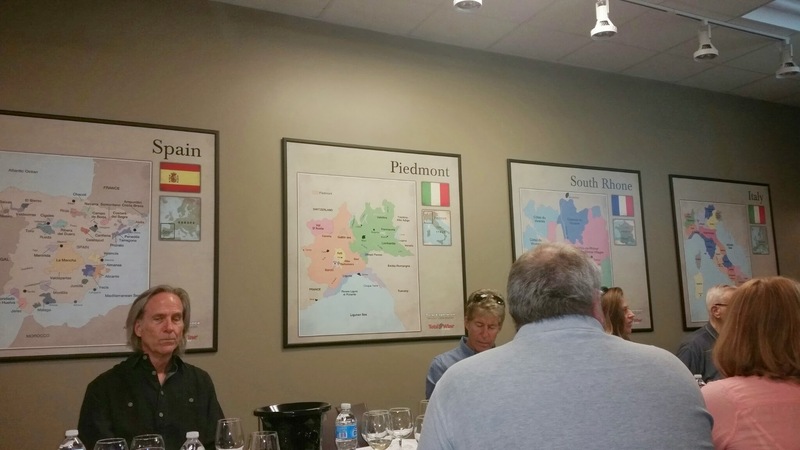 I attended a Rhone Valley France class in the past at the Huntington Beach, Total Wine and More store, so I was somewhat familiar with the format. 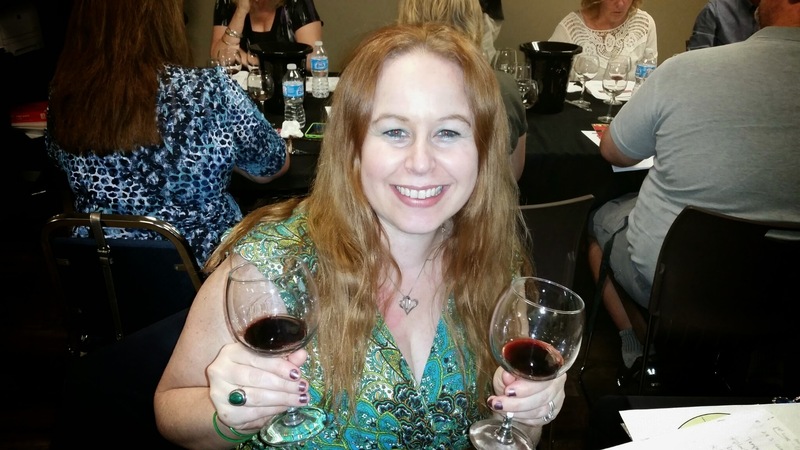 To read about French Rhone Valley Wine class click here –> RHONE VALLEY WINES OF FRANCE. To start our wine class, people began to filter into the room located on the left side of the store that is regularly held for different wine classes. I also found out that people can even rent the room out for private parties! Super cool Total Wine & More!!! 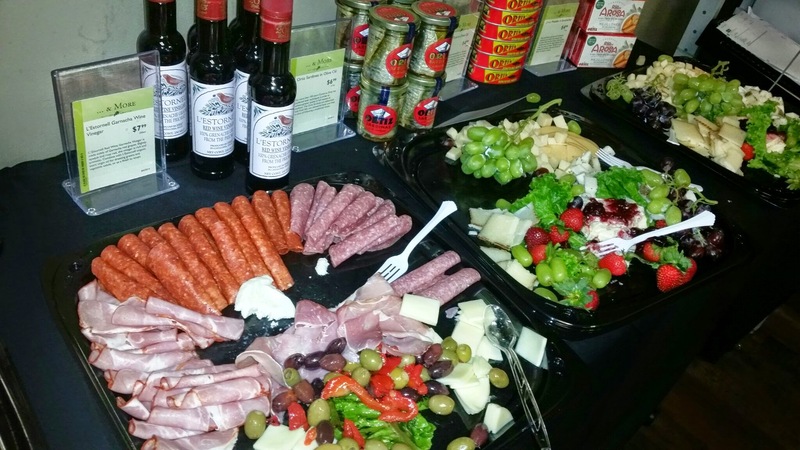 As people entered the room, there was a gorgeous spread of fruits, veggies, meats, cheeses, breads and dips for people to load up their plates for the ultimate wine tasting experience. When you are going wine tasting, it is always important to have goodies to devour! 🙂 The variety of cheeses was selected to pair nicely with the wines and after we all checked in with our wine teacher, Kirk Green, we were ready to start our journey! 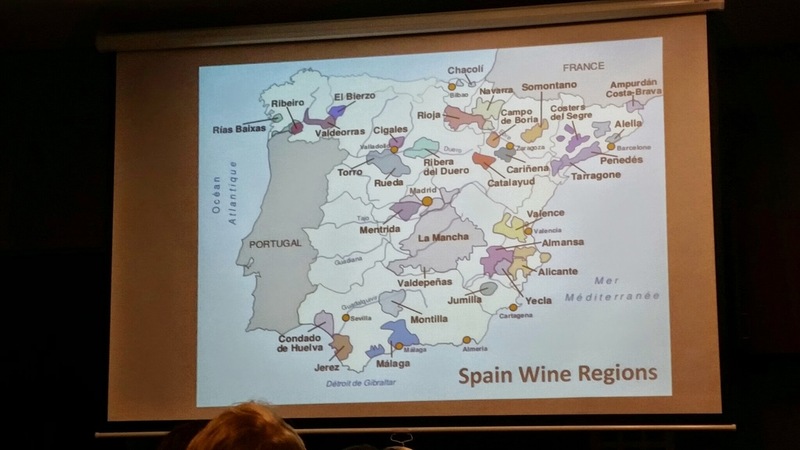 To start our evening Kirk shared a few interesting facts with us at about the Spain wine region which included the fact that Spain has 65 “DO’s” or Denominaciones de Origen or Wine Appellations. It has 2 “qualified” DO’s, which means that the 2 specific regions have quality standards that are a bit higher than the rest. Those 2 regions are DOC Rioja and DOQ Priorat. DOC stands for Denominación de Origen Calificada or Qualified Appellation of Origin. DOQ is the same but derives from the Catalan dialect of Spanish, and uses Qualificada instead. Also, 90% of Spanish vineyards are at higher altitudes than any major wine regions in France, and American Oak Barrels were preferred for centuries, but now they have begun to use French Oak. 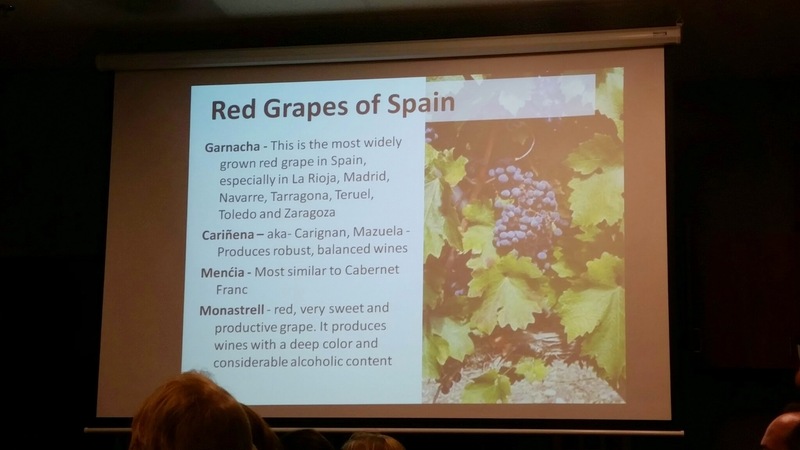 The red grapes of Spain used for their wine production included Tempranillio, Garnacha, Carinena, Mencia, and Monastrell. For a full list of Portugal grape varieties, see here –> Portugal Grapes used for wine production. In regards to Portugal, they are actually the 6th largest wine producer in the entire world! This fact amazed me since I have not had wines from Portugal prior to this event & they are not ones I normally see in my local store. 🙂 Portugal is known for 2 different types of wine, which include Fortified (which includes Port & Madeira) and Table Wine (still whites and reds) The Portugal wine region has 4 regarded DOC regions in comparison to Spain having only 2. The 4 regions are Vinho Verde, Douro, Dao, and Alentejo. For the purposes of our wine class, we had the opportunity to taste 10 different wines at our leisure and we were able to revisit any of the wines we chose to try again. The wines selected paired quite nicely with the tasty cheeses provided and I have to say one of my favorite combinations was the Smoked Gouda cheese with the Valserrano Rioja Monteviejo 2006! 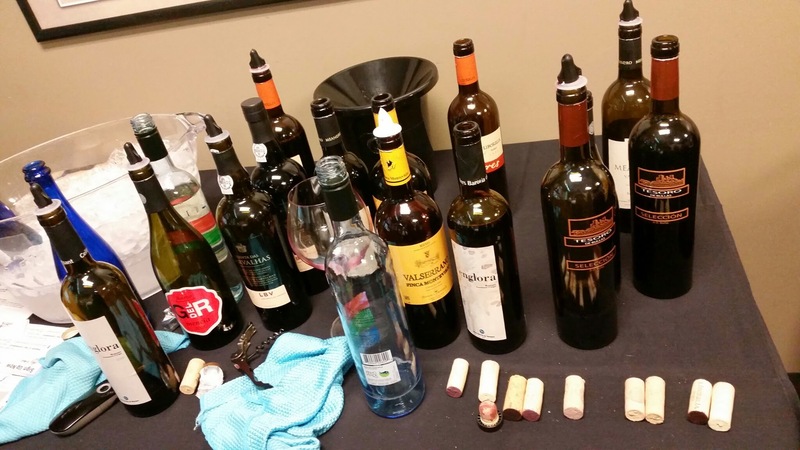 The wines we tried in this class in order included Rondel Brut Cava, Nobilis Vinho Verde, Val Do Sosego Albarino Rias Baixas 2013, G del R Bierzo Mencia 2008, Tesoro de Bullas Monastrell Sel 2008, Baronia del Montsant Englora 2008, Liberalia Toro Tres 2009, Valserrano Rioja Monteviejo 2006, Quinta Do Vale Meao Meandro 2010, & Quinta das Carvalhas LBV. All of these bottles were under $25 and of course my favorite, Valserrano Rioja Monteviejo 2006 that was $41.99 a bottle…the most expensive. :) However I did have another favorite and it was one of the most economical priced on the list at only $7.99 & I got my 10% off…had to get 2 bottles. The wine I had to have 2 bottles of was the Rondel Brut Cava & it reminded me of a lovely Italian Prosecco, crisp and refreshing…definitely a Jacuzzi wine. :) I also got a nice bottle of the Baronia del Montsant Englora 2008 at $16.19 with my 10% off! I definitely recommend attending a wine class at Total Wine and More and they also offer beer classes as well! These classes are a great way to gain knowledge about specific wine regions for both experienced and non experienced wine drinkers. It is really interesting to see what an important role soil and climate play in the different regions in regards to the flavors of the wine that come forth. Just remember that everyone has a different palate and a wine that you may enjoy greatly, someone else may totally despise, but that is why it is great to take these classes…it gives you an opportunity to try new wines and find ones you love! 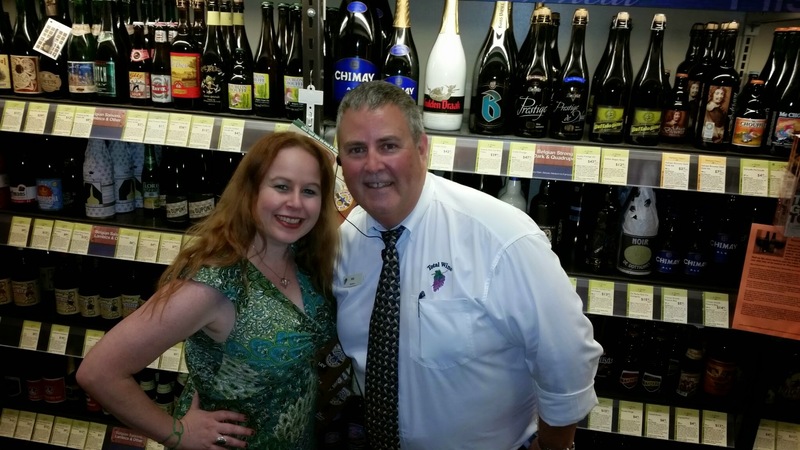 Have you ever been to the Total Wine and More wine classes? I would love to hear about your experience below if so! I cannot wait to go back for another class in the future. I love being wine educated! It is a great way to find wines to have at your home when you host a party or attend a party or event! 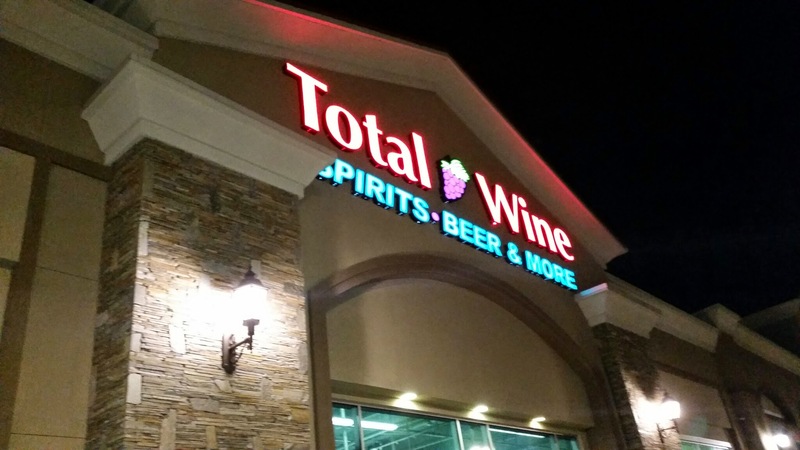 For a list of Total Wine and More classes in your area (they are available in all states) see link here –> Total Wine and More classes. I have never been to a wine class. Nor have I tasted Portuguese wines. I do like Spanish wines, since they have some very nice ones. That’s is awesome I didn’t much know about wine and how much work that was involved to making it. Thanks Danielle for posting this. 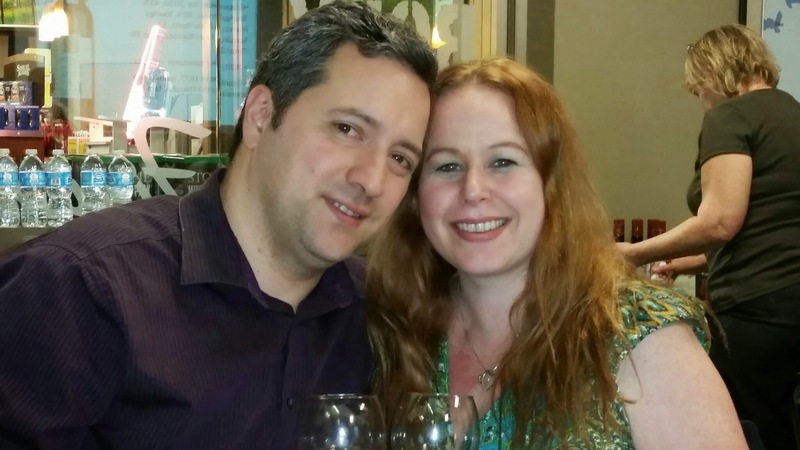 Wines of Spain & Portugal are pretty spectacular! Check them out when you get the chance to do so! I need to go with you to one of these amazing wine tastings. They look so fun! Classy collection of wines on display there. I dont drink but my husband would love this class. It was pretty amazing! It is so awesome to try the wines from different regions. 🙂 I hope your hubby gets to check out this class soon! Great post! 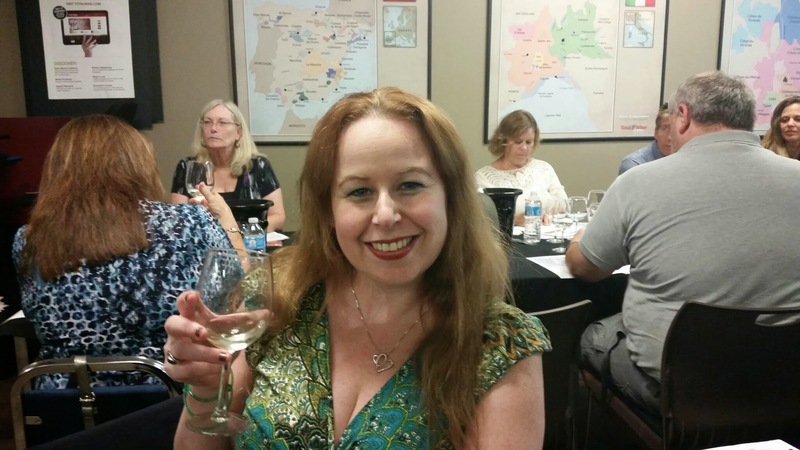 I love Spanish wines and wine tasting!